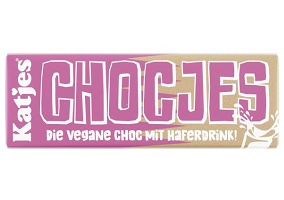 Katjes, the German sugar confectionery firm, is making its debut in the chocolate category with the launch of Katjes Chocjes, a vegan chocolate bar made using oat milk instead of cow’s milk. According to a report in Horizont, the new Katjes line is intended to have a focus on sustainability. The cocoa used in the bar is described as UTZ certified, while the paper wrapping is claimed to have FSC certificaton. Due to be available from May, Katjes Chocjes comes in Original and Hazelnut varieties, the latter claimed to contain 14% hazelnut. The 50g bars will be priced at €1.49 ($.170). Commenting on the launch, Katjes CEO Tobias Bachmuller said: “With the expansion of our product line through the launch of Chocjes we are strengthening our commitment to ‘create great things’. Obviously Katjes is an expert at vegetarian fruit jelly sweets. But with Chocjes we are also catering to a growing consumer audience that is seeking out alternatives to cow’s milk”.